Nevus sebaceous (NS) wasfirst described by Jadassohn as a circumscribed hamartomatous lesion composed of sebaceous gland in 1895. Pinkus designated the term “organoid nevus” as it is not confined to sebaceous gland but involves proliferative changes in sweat glands and hair follicles as well. NS presents as well-defined area of alopecia with smooth surface and yellowish discoloration during the infantile stage. The second stage in the life history of the organoid nevus occurs during adolescence and is characterized by an increase in the thickness of the lesion, which may then show a smooth surface with nodularities [Figure 1]. In adult or third stage, lesions become more verrucous and lobulated [Figure 2]. Importantly, various appendageal tumors including benign and malignant such as trichoblastoma, syringocystadenoma papilliferum, and basal cell carcinoma develop during this stage., The progression and frequency of tumors increase with the age of the patient. Benign tumors are seen in about 13.6% while malignancies are met within 1% of the cases of NS. Hence, it is very important and becomes mandatory to follow the course of NS for the early detection of the neoplasms. 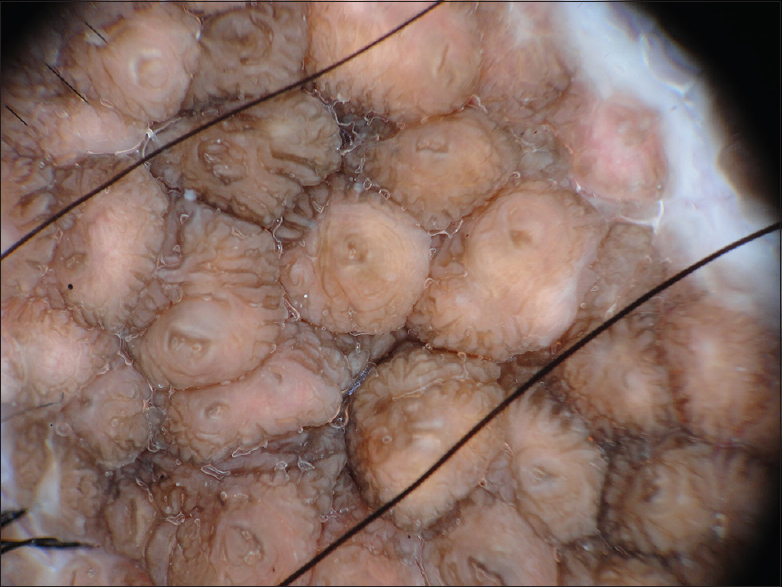 Trichoscopy, being noninvasive and in vivo diagnostic technique, can be utilized in this condition as it plays a vital role in the diagnosis of this condition by demonstrating specific trichoscopic patterns. Hence, it can be a good bedside diagnostic tool to identify various tumors developing within NS. Here, authors have described the patterns of NS on trichoscopy and also the importance of trichoscopic examination is being highlighted. This study was conducted in S. Nijalingappa Medical College, Bagalkot, South India. It is a case series study. Ten patients with clinically suspected NS lesions were included in the study. Ethical clearance was obtained by the Institutional Ethical Committee and informed consent was obtained from patients. Dermlite 3 dermoscope (×10 magnification) with polarized lights was employed in the study. Sony camera (Digital, 14 Mega pixels) was attached to save the images. Ultrasound gel was applied either on the faceplate of dermoscopy or on the skin lesions and then lesions were observed through the eyepiece of dermoscopy. All NS lesions were subjected to histopathology for confirmation of diagnosis. Correlation of histopathological changes and trichoscopic patterns was done [Table 1]. Data collected are analyzed and tabulated in Microsoft excel sheet. The results are presented in proportions and percentages. A total of 10 patients including six males and four females were present in the study. The mean age was 20 years (minimum 10 years and maximum 30 years). Duration of lesions was ranging between 10 and 30 years as lesions were present since birth in all the patients. Two patients were below 13 years (11 and 13 years) with childhood stage of NS and eight patients were aged more than 19 years who exhibited adulthood stage of NS. There were no patients with the infantile stage of NS in our study. The single lesion was present on the scalp in each patient. 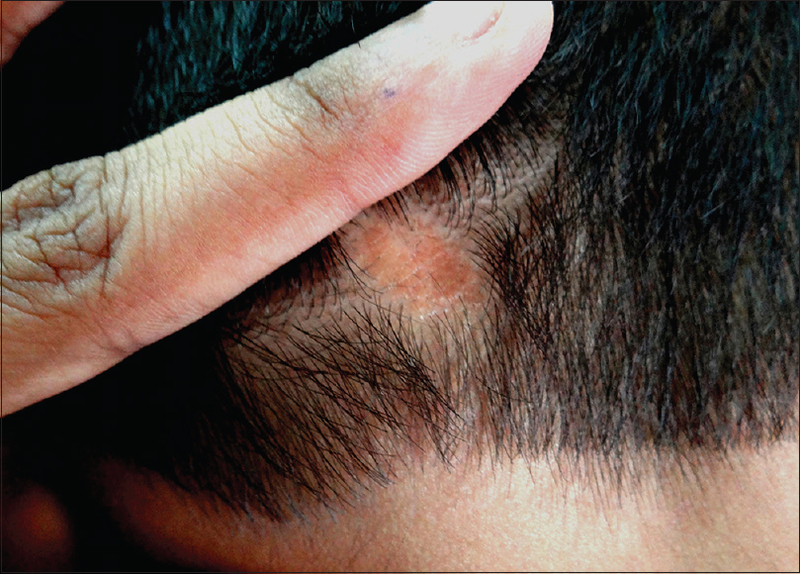 Yellowish plaques were seen on the scalp in 20% of patients. The verrucous, lobulated and nodular tumor was observed in remaining 80% of patients. Trichoscopy demonstrated yellowish globules arranged in a “cobblestone pattern” in 20% of patients [Figure 3]. In 80% of patients, globules were brown in color and two patterns were observed. In one pattern, globules were arranged in “cerebriform pattern” [Figure 4] and in another, globules characterized by crater at center with peripheral striations or extensions [Figure 5]. In one patient, lesions of NS were in transition phase and trichoscopy demonstrated orange and brown globules in the cerebriform pattern. This pattern was appearing as lava flow of an erupting volcano [Figure 6]. Skin biopsy was taken from each lesion using 4 mm punch. 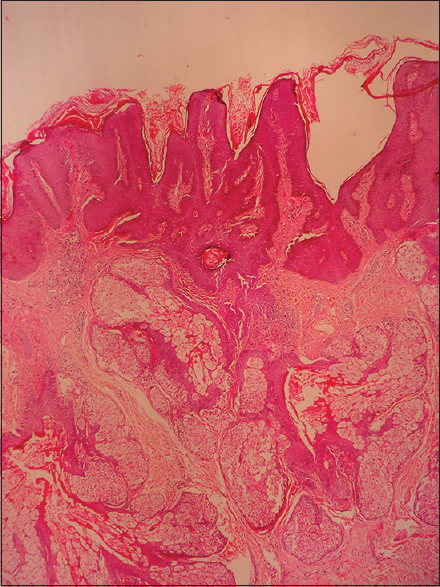 Histopathology in childhood stage revealed normal epidermis with numerous, hyperplastic sebaceous glands and small, primordial hair follicles. Apocrine glands were noted with dilated lumina [Figure 7]. In adulthood stage, there was epithelial hyperplasia and papillomatosis. 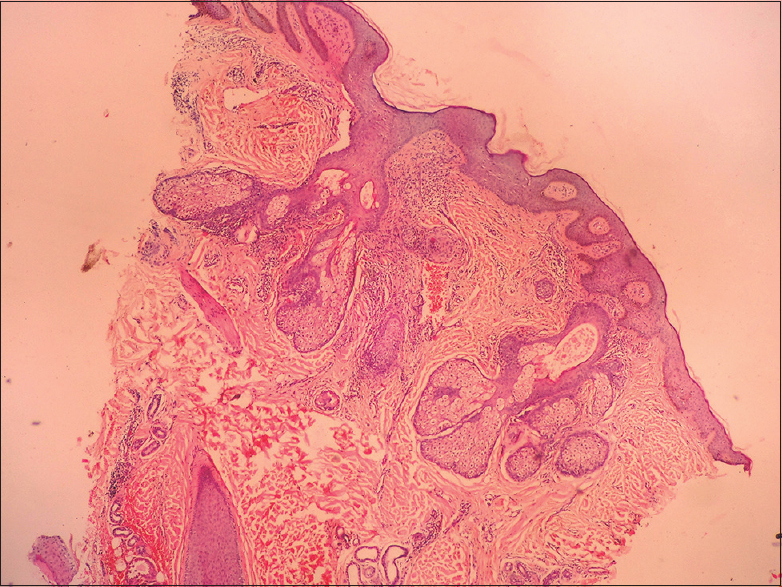 In the dermis, large sebaceous glands, ectopic apocrine glands, and primordial hair follicles were noted in histopathology [Figure 8]. Trichoscopic patterns and their histopathological correlation are shown in [Table 1]. NS is a benign adnexal tumor appears at birth requiring no intervention. When proliferative growth starts, numerous neoplasms grow in along with NS. There are reports of benign as well as malignant tumors developing in NS. Basal cell carcinoma, syringocystadenoma papilliferum, trichoblastoma, and hidradenoma are documented to arise in NS. In a report, authors described six tumors including syringocystadenoma papilliferum, tubular apocrine adenoma, sebaceoma, pigmented trichoblastoma, and superficial epithelioma with sebaceous differentiation and tumor of follicular infundibulum appearing in NS. Because of benign nature of NS, some authors are an opinion that excision is not mandatory. Hence, it is important and necessary to follow-up the lesions of NS when excision is not planned during childhood. Trichoscopy is now widely used as a tool to diagnose many pigmented and nonpigmented cutaneous lesions. It visualizes the subtle sub-surface structures in a magnified view. Thus, it aids in the detection of new neoplasms arising in NS including both benign and malignant. The infantile stage of NS is specifically characterized by the presence of yellow lobed structures, bright yellow spots that are not associated with hair follicles. It is difficult to discriminate NS of the infantile stage from other congenital lesions on the scalp. Aplasia cutis, especially membranous type looks similar to infantile stage of NS clinically. In a report, Tosti and Piraccini described the trichoscopic patterns of aplasia cutis. Neri et al. reported a case where in trichoscopy was useful in differentiating early sebaceous nevus and aplasia cutis congenita in an infant. However, authors could not observe infantile stage of NS in this study. In childhood stage, trichoscopy revealed yellowish globules in “cobblestone pattern.” Yellowish globules correspond to dermal conglomerations of numerous, hyperplastic sebaceous glands in the histopathology. Yellowish globules are also seen in sebaceous hyperplasia and sebaceous adenoma. In all these tumors, vessels are pushed toward periphery due to hyperplastic glands and these vessels are referred as “crown vessels.” Nevertheless, authors did not describe “cobblestone pattern” in their study which was specifically observed in this study. However, crown vessels were not noted in this study. There are no reports of trichoscopy in the adult stage of NS in the literature. 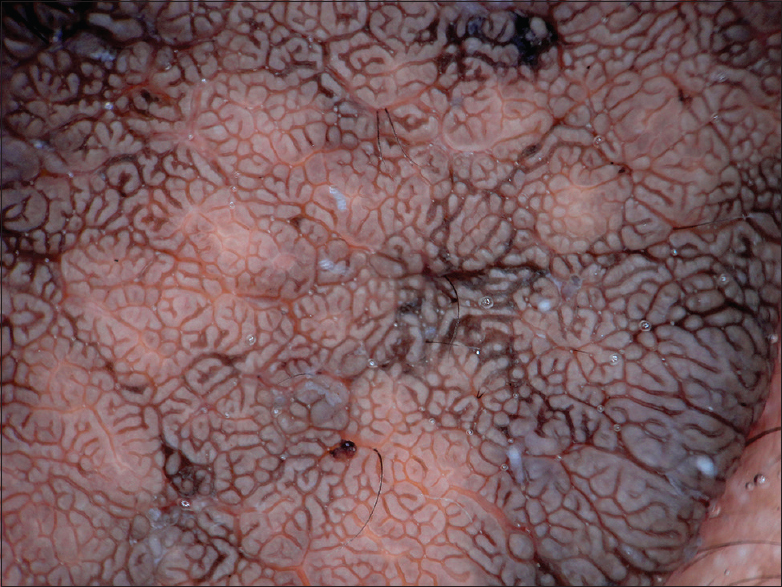 In the adult stage, trichoscopy of NS demonstrated fissures and ridges which were arranged in “cerebriform pattern.” The color of globules becomes brown in this stage. This pattern correlates to epithelial hyperplasia and papillomatosis in the histopathology. Although this pattern is noted in seborrheic keratosis, comedo-like openings, moth eaten borders, milia-like cysts, and telengiectasia are characteristically observed in seborrheic keratosis. These are conspicuously absent in NS. Interestingly, regular trichoscopic examination of NS detected the development of basal cell carcinoma in two patients which was not evident on clinical examination. One patient with 25 years of age developed nodular basal cell carcinoma in the adult stage of NS during 8 months of follow-up [Figure 9]. 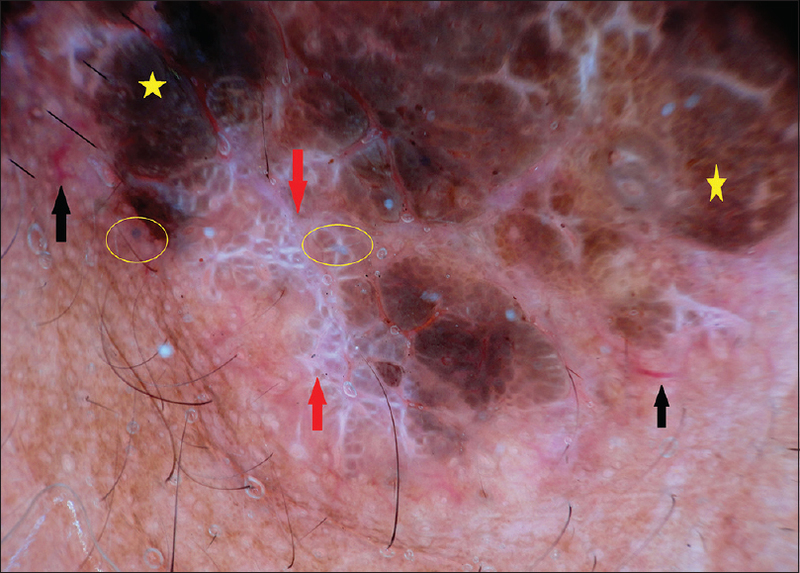 Trichoscopic features of nodular basal cell carcinoma included arborizing telengiectasia, white structures and blue-gray globules on the tumorous growth. These patterns were characteristic of basal cell carcinoma as described by Menzies et al. Authors could observe the development of superficial basal cell carcinoma in another patient with 22 years of age in 6 months of follow-up. Telengiectasia, blue-gray globules, and white structures were noted [Figure 10]. These patterns were consistent of superficial basal cell carcinoma. However, in this study pinkish-white background, which is characteristic of superficial basal cell carcinoma, was not noted. This is probably because of the brown complexion of Indian patients. De Giorgi et al. described occurrence of multiple neoplasms in NS which were evaluated by trichoscopy and authors were of the opinion that trichoscopy was not useful in the detection of new growths in NS. However, in a study by Enei et al., who observed the development of basal cell carcinoma in the facial NS by dermoscopy. In this study also, trichoscopy played a vital role in the documentation of new growths in NS. Hence, it is evident that trichoscopy is best diagnostic tool in the detection of neoplasms occurring on NS particularly in the adult stage. In one patient, NS was rapidly growing and attained big size within months. Trichoscopy demonstrated brown and orange globules in the cerebriform pattern. 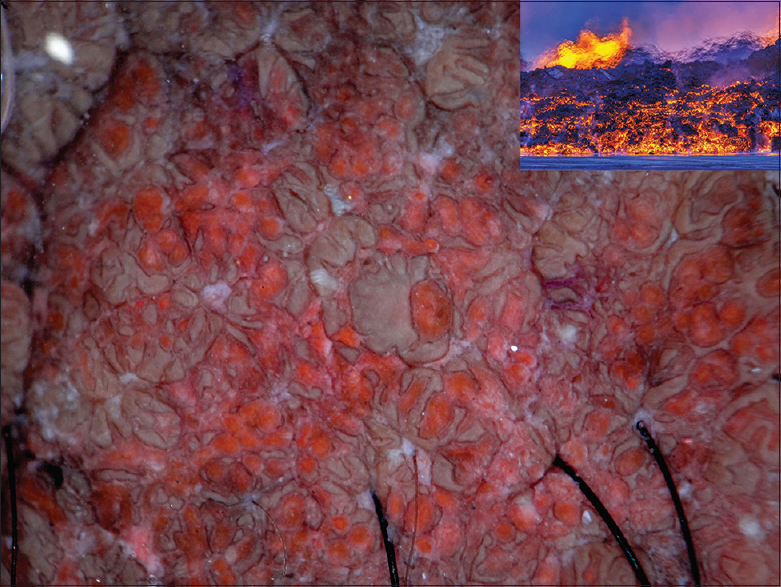 Here, brown globules represent matured and hyperplastic sebaceous glands and orange globules correspond to immature sebaceous glands in histopathology. This particular pattern was appearing as lava flow of an erupting volcano. Authors believe that this is because of transition phase of NS. However, this was observed in one patient further studies are required in this regard. Trichoscopy helps in the diagnosis of NS with specific patterns. Yellowish globules in the cobblestone pattern and cerebriform patterns are specific to childhood and adult stages of NS respectively. It also aids in the detection of new growths in the lesions of NS. It is useful especially when resection of NS is not planned. Hence, trichoscopy is good, noninvasive diagnostic technique in NS. Authors strongly recommend regular trichoscopic examination of NS. Further studies involving large sample size are suggested. Lantis S, Leyden J, Thew M, Heaton C. Nevus sebaceus of Jadassohn. Part of a new neurocutaneous syndrome? Arch Dermatol 1968;98:117-23. Morioka S. The natural history of nevus sebaceus. J Cutan Pathol 1985;12:200-13. Mehregan AH. Sebaceous tumors of the skin. J Cutan Pathol 1985;12:196-9. Rulon DB, Helwig EB. 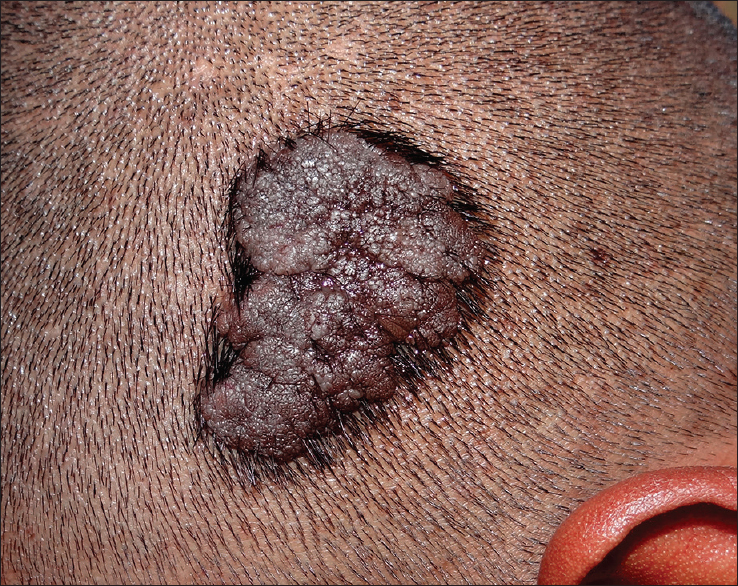 Cutaneous sebaceous neoplasms. Cancer 1974;33:82-102. Cribier B, Scrivener Y, Grosshans E. Tumors arising in nevus sebaceus: A study of 596 cases. J Am Acad Dermatol 2000;42(2 Pt 1):263-8. Miller CJ, Ioffreda MD, Billingsley EM. Sebaceous carcinoma, basal cell carcinoma, trichoadenoma, trichoblastoma, and syringocystadenoma papilliferum arising within a nevus sebaceus. Dermatol Surg 2004;30 (12 Pt 2):1546-9. Jaqueti G, Requena L, Sánchez Yus E. Trichoblastoma is the most common neoplasm developed in nevus sebaceus of Jadassohn: A clinicopathologic study of a series of 155 cases. Am J Dermatopathol 2000;22:108-18. Ankad BS, Naidu MV, Beergouder SL, Sujana L. Trichoscopy in trichotillomania: A useful diagnostic tool. Int J Trichology 2014;6:160-3. Kantrow SM, Ivan D, Williams MD, Prieto VG, Lazar AJ. Metastasizing adenocarcinoma and multiple neoplastic proliferations arising in a nevus sebaceus. Am J Dermatopathol 2007;29:462-6. Gozel S, Donmez M, Akdur NC, Yikilkan H. Development of six tumors in a sebaceus nevus of jadassohn: Report of a case. Korean J Pathol 2013;47:569-74. Stavrianeas NG, Katoulis AC, Stratigeas NP, Karagianni IN, Patertou-Stavrianea M, Varelzidis AG. Development of multiple tumors in a sebaceous nevus of Jadassohn. Dermatology 1997;195:155-8. Tosti A, Ross EK. 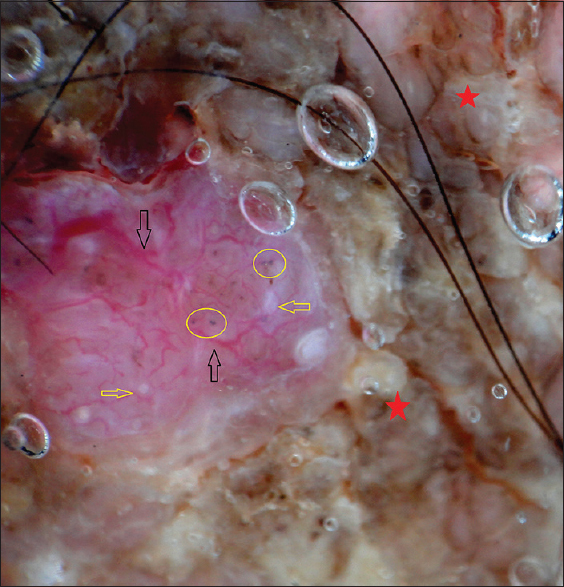 Patterns of scalp and hair disease revealed by videodermoscopy. In: Tosti A, editor. 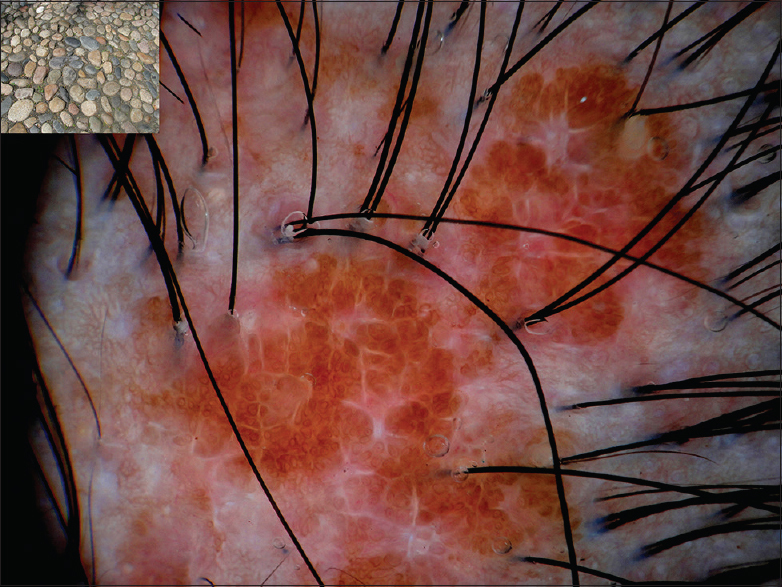 Dermoscopy of Hair and Scalp Disorders. 1st ed. London: Informa Healthcare; 2007. p. 1-14. Neri I, Savoia F, Giacomini F, Raone B, Aprile S, Patrizi A. Usefulness of dermatoscopy for the early diagnosis of sebaceous naevus and differentiation from aplasia cutis congenita. Clin Exp Dermatol 2009;34:e50-2. Tosti A, Piraccini BM, editors. Hair diseases in children. In: Diagnosis and Treatment of Hair Disorders: An Evidence Based Atlas. 1st ed. London: Taylor and Francis; 2006. p. 89-101. Kim NH, Zell DS, Kolm I, Oliviero M, Rabinovitz HS. The dermoscopic differential diagnosis of yellow lobularlike structures. Arch Dermatol 2008;144:962. Kittler H, Rosendahl C. Pattern analysis: Basic principles. In: Kittler H, Rosendahl C, Cameron A, Tscandl P, editors. Dermatoscopy: An Algorithmic Method Based on Pattern Analysis. 1st ed. Vienna: Facultas.wuv; 2011. p. 49-115. Menzies SW, Westerhoff K, Rabinovitz H, Kopf AW, McCarthy WH, Katz B. Surface microscopy of pigmented basal cell carcinoma. Arch Dermatol 2000;136:1012-6. Johr RH, Stolz W, editors. Dermoscopy from A to Z. In: Dermoscopy – An Illustrated Self-assessment Guide. 1st ed. New York: McGraw Hill; 2010. p. 1-26. De Giorgi V, Massi D, Trez E, Alfaioli B, Carli P. Multiple pigmented trichoblastomas and syringocystadenoma papilliferum in naevus sebaceous mimicking a malignant melanoma: A clinical dermoscopic-pathological case study. Br J Dermatol 2003;149:1067-70. Enei ML, Paschoal FM, Valdés G, Valdés R. Basal cell carcinoma appearing in a facial nevus sebaceous of Jadassohn: Dermoscopic features. An Bras Dermatol 2012;87:640-2.